“If you don’t want a mark in the metal don’t put it there”. This simple saying would save jewelers lots of time if they were able to apply them. Jewelers spend hours fixing damage that they themselves did to the metal. 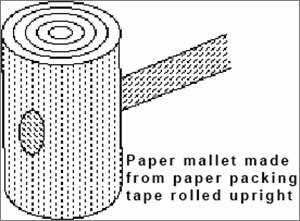 Soft hammers and shaping tools limit the injuries to the metal being worked, with the best quality of all (the least damage to metal while still shaping it) being paper mallets. Leather however remains tried and true as material for making mallets from. Some can be found at your local Pet Supply Store. You can buy round leather dog chews in different diameters at the pet store, cut them in half, drill through them and mount an appropriate sized hammer handle in them to make very inexpensive good quality leather mallets, particularly in the small sizes. Look for one that is solid all the way through as some will have cavities in them. One chew makes about three hammers. The softer the mallet surface the less damage there is to the metal surface being worked, and the faster it is make a piece. Limiting surface damage is essential for smart goldsmithing. 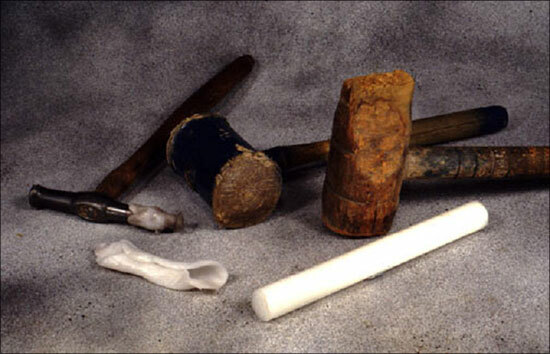 Here is a picture of several soft hammer options, from left to right: a steel hammer with an Aquaplast extension, a paper mallet, a reshaped croquet mallet and a delrin rod to make hammers from. 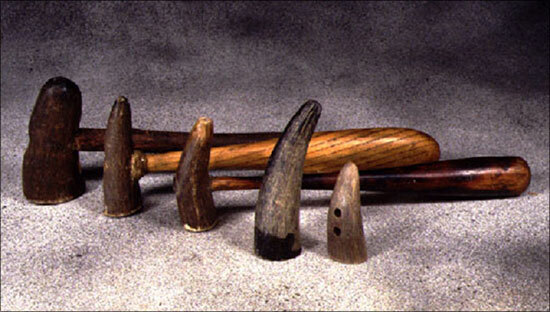 Horn hammers are pleasant to use and good ones can be made from water buffalo horn (try a knifemaking supplier for sources). Moose and other antlers work but tend to disintegrate in use. 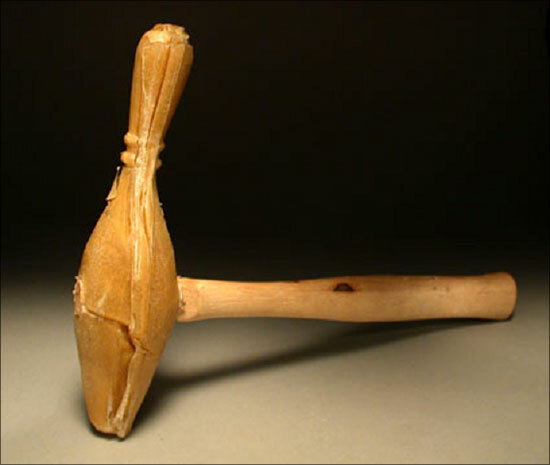 An easy place to get a small horn tip to make a hammer with is as an old Horn button for a duffel coat: they come with holes to mount them on a hammer handle. If you need to shape larger areas of metal. 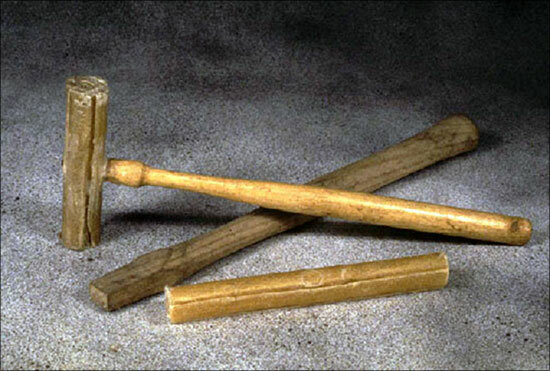 There are wooden knobs from craft stores and furniture components that make good wooden mallets as well as larger sized dapping tools. 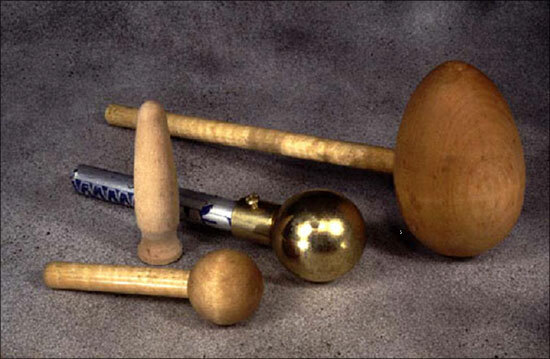 Here is a selection of knobs.